LIFEHE - Comfy, Style and Confidence for Your Everyday Life. LifeHe is your online stop for Modern, Irresistible, and Affordable men's clothing. Our carefully curated selection of apparel, accessories, and outerwear are always on trend and always available at the web's best prices. We want to make you look good for less. If you are craving for something new, fresh, and stylish then we will help you get the perfect look! LifeHe offers a huge selection of the latest clothing and accessories for men. Button-front jacket featuring button-flap chest pockets and side-entry hand pockets. Made of denim cotton, thicken with fleece lined,Comfortable Fabric with fashionable design. 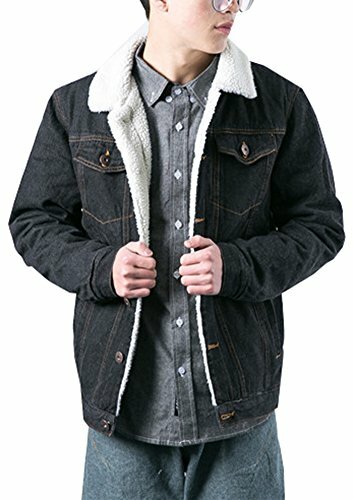 Denim jacket is suitable for outdoor and sports wear: hiking,traveling,riding,driving,walking,casual and other sports. If you have any questions about this product by LifeHe, contact us by completing and submitting the form below. If you are looking for a specif part number, please include it with your message.